The header of this blog comprises two images that I felt were thematically and philosophically apt. 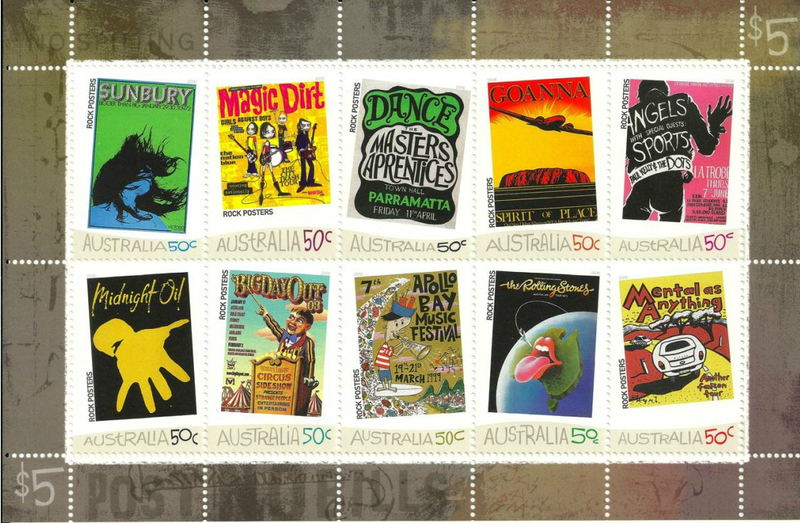 The colourful stamps in the background come from Australia’s 2006 ‘Rock Posters’ release, showcasing the talents of Australian designers as demonstrated in posters for various festivals, tours and gigs. I loved this issue. It was a kick in the balls compared to our usual diet of cute furry animals and dreary royals. Nice to see Australia Post acknowledge the possible existence of Australians who might not be as obsessed with sport and wildflowers as it seems to think most of its market is. What a coincidence, Punk is wearing that little black Alexander McQueen number at her desk as she types. Every year, Australia Post announces a new set of apparent ‘Legends’ to be featured on a stamp issue. I’ll have more to say on that in due course, but in 2005, six fashion designers were featured. Let’s compare the issue above with AP’s issue. In case you’re wondering, that is not a greyscale scan. That’s how they looked. 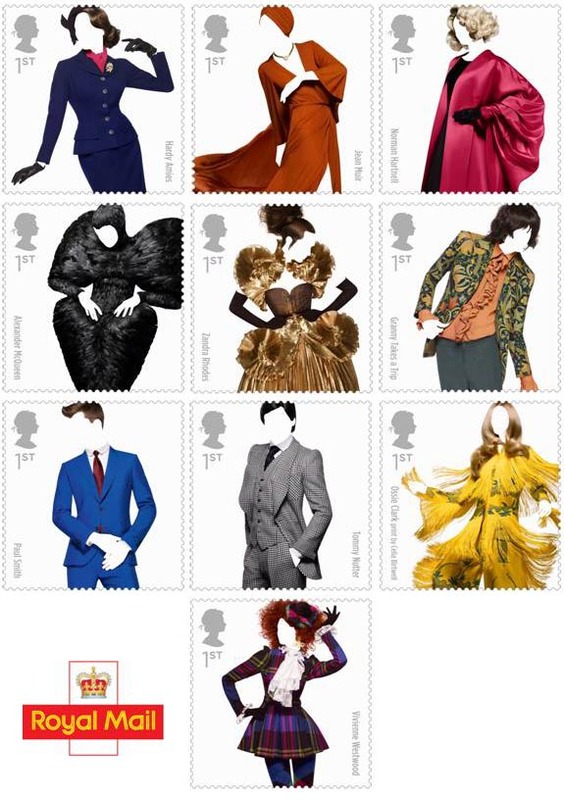 It’s fair to note that the Australian issue honours the individuals, while the UK issue is about the clothes. But if you were honouring fashion designers, wouldn’t you want to include more, you know, fashion? Which issue ultimately does the greater service to its nation’s fashion industry and, by association, its greatest designers? Hi; Read your article in IFSDA, wonderfull, Keep up the good work. Why not put in your blog the two stories from the “Dedicated Bidders” from the IFSDA? Wish I could write like you.I.Bayer, a young 91. Thank you for your comments! I haven’t actually seen the IFSDA journal yet. Nice to hear that I made the cut. I shall have to keep an eye out for the Dedicated Bidders. Sounds intriguing.